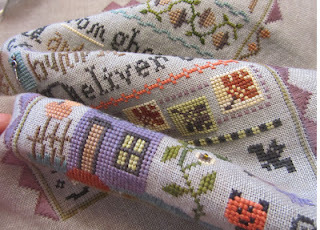 Here is a sneek peek of the Lizzie Kate Mystery Sampler pattern, fabrics, and threads!!! We are getting soooo excited here at Norden now that things are starting to come in. It will take us about a million trips around the table to make all these thread packs up, but rest assured we will begin shipping on June 27th! Thank you to all of you that have joined in on the fun this summer with LIZZIE*KATE, NORDEN CRAFTS, AND WEEKS DYE WORKS!